Thanks for your continued hard work Jane. It must gratifying to see some positive action on the part of our new government. I’m very, very happy to see it. I guess we just stole back our money they stole from us…. or at least some of it…. congratulations to all who fought… donated… supported… reported…. or had the sense to dig in and make a stand… you all have made a huge differance in alot of peoples lives and for that i am eternally grateful…. Well presented Jane and THANK-YOU doesn’t seem enough. With all the actual, conclusive, irrefutable, undeniable, detrimental data that has amassed over the years, it is hard for me to comprehend how anyone cannot understand how much time and money and material has been lost with this green gone wrong fiasco. The harm done cannot be corrected! Now the embellishments and deceit of the so-called facts needs to be recognized and stopped. The battle has been won but the war continues. Has Ontario also been under a blocking high pressure area/system the past few days? Hopefully turbines in projects that are up and running will be turned off so that all of the absolutely innocent men, women and children being harmed will have a chance to recover from the harm. Hopefully their bodies can fully recover. This action must be made a high priority. What a relief it must be for Dutton Dunwich residents! A while ago I spoke to a certain young lady about one aspect of the false information being presented on the Canadian Wind Energy website. I was told that the info is provided by a very reliable source. Reliable according to who I asked! No-one returned with an answer to my question. That young lady seems to be gone along with the bogus info. Has anyone seen a list of the energy projects that have been cancelled? Over how many years has the $800,000,000 savings been spread? How has the savings been calculated? For the recent english list of cancelations type the following into your search enine. It should come up at the list but depending on your engine it might come up somewhere else in the program then just scroll to the section you are interested in. Sorry I can’t help you with the other queries. Thanks for the list. I thought the new government would have made it more accessible. I do think axing farm, landfill, and sewer farm biogas plants might be a mistake. A good way to get rid of methane. Good riddance to the rest of them. I know you have heard this before. You should try living it, day to day, for the past 10 years, since the turbines came to Clear Creek, ON. I am no longer able to teach. The loss of my livelihood was not my choice. The humiliation I have experienced from others who do not understand the harmful impact of exposure to infrasound has also been devastating. Financial hardship, towing the line – paying taxes on my home surrounded by industrial wind turbines where I cannot live, while renting a place far away from the turbines to live safely, for the past ten years has cost well over $150, 000. Due to the sensitivity and illness I have developed caused by exposure to infrasound, I am very limited as to where I can live. I will not live any closer then 10 km from a turbine development. For someone who was raised at Long Point Ontario, and has spent all of her life residing on the shore of Lake Erie, which is now plastered with wind turbines, this is very devastating. Norfolk County continues to turn a blind eye, hoping I will go away or die. I just may do that. I hope the fight continues. I hope the people who have experienced this nightmare, living amongst the turbines and becoming ill, will not be forgotten. Stephana will not rest in peace until this is made right. As for compensation, perhaps based on the entire impact, the wilky nilly wreckless spending of our past government, the value of human life and health, the loss of my home, my job, family members, ten years of past hardship. I don’t think there is anything that will rectify what I have lost. Bury me when I leave this earth, turn the page. 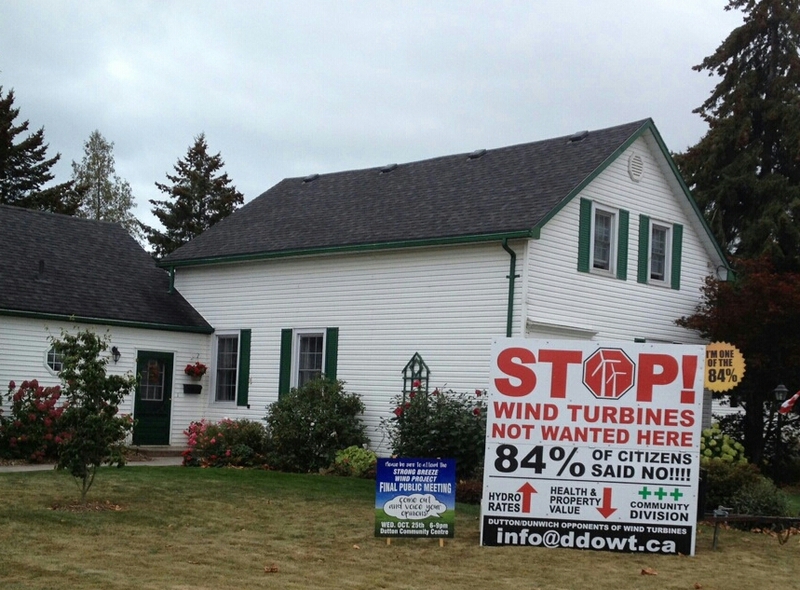 Last summer I asked original owner of turbine developer in Clear Creek Ontario, to purchase my home for a reasonable amount of money, which now sits empty in Clear Creek, due to his turbine evelopment. His name is Mike Crawley. He is a an associate of Dalton Mcguinty. Crawley is also former president of the Federal Liberal Party. He has collected a huge amount of money in government subsidies in building these harmful developments. He is well aware of my hardship due to his development. He is currently continuing development and destruction in northern Ontario. His response to me was that he no longer has interest in the development in Clear Creek. He wished me well, and directed me to the current corporation. I have also been told through legal correspondence, to back off, and they will not come after me for legal fees incurred. I was once a happy, hard working, productive contributing member of society. I raised a family. I hold two university degrees. I was a high school teacher and a department head. I now really have little left they they can take. So take my life. I will be on a much better place. Tracy, I think of you every day as I work to protect all residents from the harm you say is irreversible. Sharing your experience again and again is so important. Thank you. The grief this has caused you is outrageous. Allowing people to be harmed by these turbines and their infrastructure is a human rights violation, whether this has been declared in the courts or not. The financial burden and the stress of a legal challenge should not have been/be imposed on people who are being harmed. This ethical crisis should have been judiciously addressed long ago. How can the Huron County Health Unit justify exposing residents to another year of this harm? How can they justify ignoring Dr. Mariana Alves-Pereira and all of the other warnings they were given? Why are these turbines still running? When will they be turned off permanently? Forced relocation of rural residents who must leave their homes to seek protection is unacceptable in Ontario.